← Bat box overflowing with bats. Answer: When it’s a Kingfisher box. Okay, here’s the story. 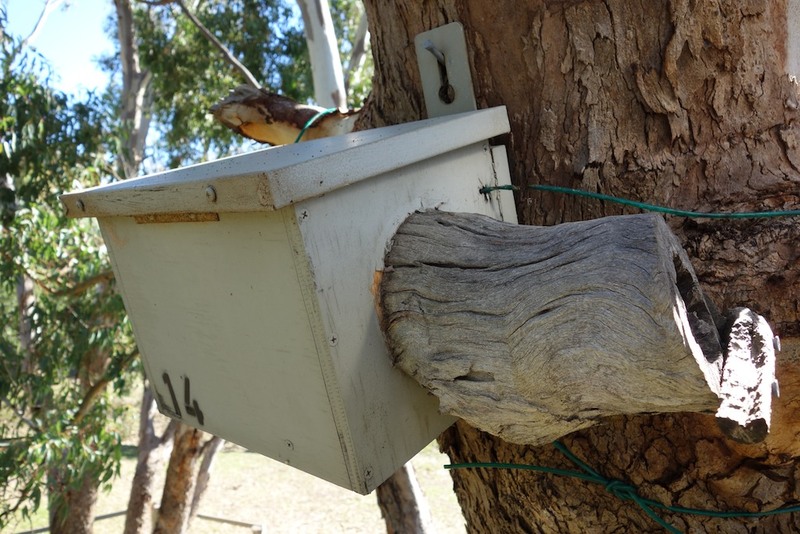 In 2008 a Kingfisher box was built for a client targeting only the Australian Kingfisher. As the image shows the dimensions are slightly larger than a shoebox. Installed on a horizontal plane with a side entrance it would have been perfect for the bird that we wanted. But low and behold during a routine box inspection guess what I found? Yes, micro bats. Have a good look and what they’re hanging onto. Yes, you guessed it. The plain untouched timber walls. This goes to show that they can really grip almost anything. So next time you are building your own bat box just score the front and side walls with a knife. The rear needs to be mesh. This makes it easy for the bats to land on and climb up. By the way the white “eggshell” in the foreground is really a spiders egg sack. You see the Huntsman spiders share the same abode without getting eaten. “What are you looking at buster” says the rear bat glaring at me. 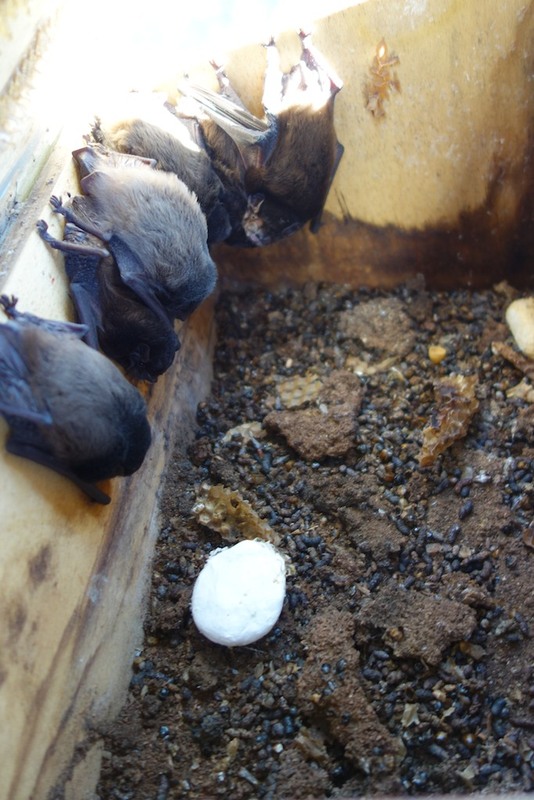 This entry was posted in Uncategorized and tagged bat boxes, Bat house, bat houses, bats, box bat. Bookmark the permalink. 2 Responses to When is a bat house not a bat house? I built a bat box a while back, about two years, similar to your Mark 2 design. We aren’t sure if it’s being used or not. It too is the type where droppings would fall out and there is garden and prickly bushes directly below it so we haven’t seen any droppings yet. I did not put an inspection lid on it nor can I get to it “quietly” with a ladder. Do you have any handy tips on unobtrusively finding out if it is being used? The best idea is to grab a chair, a drink and a platter of cheese, then park yourself closeby facing the setting sun. For about an hour after the sun has set the bats will be active. If you have them, then you will see the little black bodies fly out. Best time to do all this is Summer.